Nottinghamshire (abbreviated Notts) is an English county in the East Midlands, which borders South Yorkshire, North Lincolnshire, Lincolnshire, Leicestershire and Derbyshire. The county town is traditionally Nottingham (abbreviated Nottm. ), at 52°57'17?N, 1°09'29?W, though the council is now based in West Bridgford (at a site facing Nottingham over the River Trent). 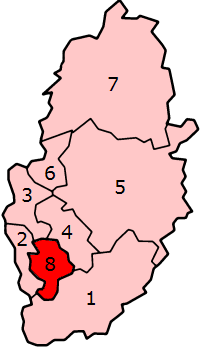 The districts of Nottinghamshire are Ashfield, Bassetlaw, Broxtowe, Gedling, Mansfield, Newark and Sherwood, and Rushcliffe. 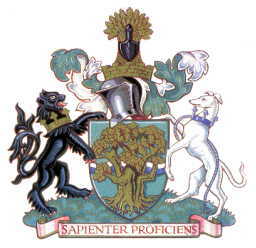 The City of Nottingham was administratively part of Nottinghamshire between 1974 and 1998 but is now a unitary authority although it remains part of the historic and ceremonial county. As of 2006 the county is estimated to have a population of just over one million. Over half of the population of the county live in the conurbation of Greater Nottingham which also spreads into Derbyshire. The conurbation has a population of about 650,000, though less than half live within the city boundaries. The earliest Teutonic settlers in the district which is now Nottinghamshire were an Anglian tribe who, not later than the 5th century, advanced from Lincolnshire along the Fosseway, and, pushing their way up the Trent valley, settled in the fertile districts of the south and east, the whole region from Nottingham to within a short distance of Southwell being then occupied by the vast forest of Sherwood. At the end of the 6th century Nottinghamshire already existed as organized territory, though its western limit probably extended no farther than the Saxon relics discovered at Oxton and Tuxford. Nottingham, after the treaty of Wedmore, became one of the five Danish boroughs. On the break-up of Mercia under Hardicanute, Nottinghamshire was included in the earldom of the Middle English, but in 1049 it again became part of Leofric's earldom of Mercia, and descended to Edwin and Morkere. The first mention of the shire of Nottingham occurs in 1016, when it was harried by Canute. The boundaries have remained practically unaltered since the time of the Domesday Survey, and the eight Domesday wapentakes were unchanged in 1610; in 1719 they had been reduced to six, their present number, Oswaldbeck being absorbed in Bassetlaw, of which it forms the North Clay division, and Lythe in Thurgarton. 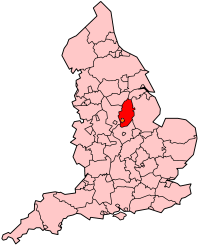 Nottinghamshire was originally included in the diocese and province of York, and in 1291 formed an archdeaconry, comprising the deaneries of Nottingham, Newark, Bingham and Retford. By act of Parliament of 1836 the county was transferred to the diocese of Lincoln and province of Canterbury, with the additional deanery of Southwell. In 1878 the deaneries of Mansfield, South Bingham, West Bingham, Collingham, Tuxford and Worlf sop were created, and in 1884 most of the county was transferred to the newly-created diocese of Southwell, the deaneries being unchanged. The deaneries of Bawtry, Bulwell, Gedling, East Newark and Norwell were created in 1888. Until 1568 Nottinghamshire was united with Derbyshire under one sheriff, the courts and tourns being held at Nottingham until the reign of Henry III, when with the assizes for both counties they were removed to Derby. In the time of Edward I the assizes were again held at Nottingham, where they are held at the present day. The Peverel Court, founded before 1113 for the recovery of small debts, had jurisdiction over 127 towns in Nottinghamshire, and was held at Nottingham until 1321, in 1330 at Algarthorpe and in 1790 at Lenton, being finally abolished in 1849. The most interesting historic figure in the Domesday Survey of Nottinghamshire is William Peverel. His fief represents the honor of Nottingham, and in 1068 he was appointed constable of the castle which William the Conqueror had raised at Nottingham. The Cliftons of Clifton and the Byrons of Newstead held lands in Nottinghamshire at the time of the Survey. Holme Pierrepoint belonged to the Pierrepoints from the time of Edward L; Shelford was the seat of the Stanhopes, and Langer of the Tibetots, afterwards earls of Worcester. Archbishop Cranmer was a descendant of the Cranmers of Aslockton near Bingliam. The political history of Nottinghamshire centres round the town and castle of Nottingham, which was seized by Robert of Gloucester on behalf of Maud in 1140; captured by John in 1191; surrendered to Henry III by the rebellious barons in 1264; formed an important station of Edward III in the Scottish wars; and in 1397 was the scene of a council where three of the lords appellant were appealed of treason. In the Wars of the Roses the county as a whole favored the Yorkist cause, Nottingham being one of the most useful stations of Edward IV. In the Civil War of the 17th century most of the nobility and gentry favored the Royalist cause, but Nottingham Castle was garrisoned for the parliament, and in 1651 was ordered to be demolished. From 1295 the county and town of Nottingham each returned two members to parliament. In 1572 East Retford was represented by two members, and in 1672 Newark-upon-Trent also. Under the Reform Act of 1832 the county returned four members in two divisions. By the act of 1885 it returned four members in four divisions; Newark and East Retford were disfranchised, and Nottingham returned three members in three divisions. Among the earliest industries of Nottinghamshire were the malting and woollen industries, which flourished in Norman times. The latter declined in the 16th century, and was superseded by the hosiery manufacture which sprang up after the invention of the stocking-loom in 1589. The earliest evidence of the working of the Nottinghamshire coalfield is in 1259, when Queen Eleanor was unable to remain in this county on account of the smoke of the sea-coal. Collieries are scarcely heard of in Nottinghamshire in the 17th century, but in 1620 the justices of the peace for the shire report that there is no fear of scarcity of grain, as the counties which send up the Trent for coal bring grain in exchange, and in 1881 thirty-nine collieries were at work in the county. Hops were formerly extensively grown, and Worksop was famous for its liquorice. Numerous cotton mills were erected in Nottinghamshire in the 18th century, and there were silk-mills at Nottingham. The manufacture of tambour lace existed in Nottinghamshire in the 18th century, and was facilitated in the 19th century by the manufacture of machine-made net. At the dissolution of the monasteries there were no fewer than forty religious houses in Nottinghamshire. The only important monastic remains, however, are those at Newstead, but the building is partly transformed into a mansion which was formerly the residence of Lord Byron. There are also traces of monastic ruins at Beauvale, Mattersey, Radford and Thurgarton. The finest parish church in the county is that of Newark. The churches of St Mary, Nottingham, and of Southwell were collegiate churches; Southwell, now a cathedral, is a splendid building, principally Norman. The churches of Balderton, Bawtry, Hoveringham, Mansfield and Worksop are also partly Norman, and those of Coddington, Hawton and Upton St Peter near Southwell, Early English. Of the old castles, the principal remains are those at Newark, but there are several interesting old mansions, as at Kingshaugh, Scrooby, Shelford and Southwell. Wollaton Hall, near Nottingham, is a fine old building (c. 1580). The finest residences of more modern date are Welbeck and others in the Dukeries. Robin Hood is a figure in archetypal English folk tales, whose story goes back to medieval times. In popular culture he is painted as a man known for robbing the rich to provide for the poor and fighting against injustice and tyranny. His band consists of "seven score" group of fellow outlawed yeomen – called his "Merry Men". He has been the subject of numerous movies, television series, books, comics and plays. 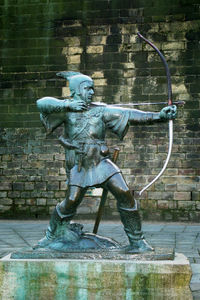 In popular culture Robin Hood and his band's tales are usually associated with the area Sherwood Forest and Nottinghamshire, though most historians point towards him being a Yorkshireman. Historically his birthplace is said to be Loxley in South Yorkshire, while his grave is at Kirklees Priory in West Yorkshire. In the oldest legends the outlaw's enemy is the sheriff due simply to his profession, but in later versions the sheriff is despotic and gravely abuses his position, appropriating land, levying excessive taxation, and persecuting the poor. In some tales the antagonist is Prince John, based on the historical John of England, who is seen as the unjust usurper of his pious brother Richard the Lionheart. In the oldest versions surviving, Robin Hood is a yeoman, but in some later versions he is described as a nobleman and Lord of the Manor of Loxley (or Locksley), usually designated Robin of Loxley, who was unjustly deprived of his lands. In other stories, he has served in the crusades, returning to England to find his lands pillaged by the dastardly sheriff. In some tales he is the champion of the people, fighting against corrupt officials and the oppressive order that protects them, while in others he is an arrogant and headstrong rebel, who delights in bloodshed, cruelly slaughtering and beheading his victims. Despite the fact that most historians and experts link Hood to real life places that still exist today, a subsection argue that his tales (although not the very earliest) have some similarities to other outlaws such as Hereward the Wake, Eustace the Monk and Fulk FitzWarin. The latter of whom was a Norman noble who was disinherited and became an outlaw and an enemy of John of England. Nottinghamshire, like Derbyshire and South Yorkshire, sits on extensive coal measures, up to 900 metres (3,000 feet) thick and occurring largely in the north of the county. There is an oilfield near Eakring. These are overlaid by sandstones and limestones in the west and clay in the east. The north of the county is part of the York plain. The centre and south west of the county, around Sherwood Forest, features undulating hills with ancient oak woodland. Principal rivers are the Trent, Idle, Erewash and Soar. The Trent, fed by the Soar and Erewash, and Idle, composed of many streams from Sherwood Forest, run through wide and flat valleys, merging at Misterton. The natural highest point of the county is Strawberry Bank, in Huthwaite. Nottinghamshire is sheltered by the Pennines to the west, so receives relatively low rainfall at 641-740 mm (25-29 in) annually. The average temperature of the county is 8.8-10.1 degrees Celsius (48-50 degrees Fahrenheit). The county receives between 1321 and 1470 hours of sunshine per year. Nottinghamshire is represented by members of parliament, of which nine are members of the Labour Party, and two are Conservatives. Geoff Hoon, representative for Ashfield, is a front-bench member of the government (2007). Kenneth Clarke of Rushcliffe is a former Conservative Chancellor of the Exchequer (2007). The County Council is Labour controlled. There are 67 councillors, of which 36 are Labour, 26 are Conservatives and five are Liberal Democrats. In 1998 Nottinghamshire had a GDP per-capita of £12,000, and a total GDP of £12,023 million. This is compared to a per-capita GDP of £11,848 for the East Midlands, £12,845 for England and £12,548 for the United Kingdom. Nottingham has a GDP per-capita of £17,373, North Nottinghamshire £10,176, and South Nottinghamshire £8,448. In October 2005 the United Kingdom had 4.7% unemployment, the East Midlands 4.4%, and Nottingham travel-to-work area 2.4%. Along the Trent on the county's eastern edge, close to the former coalfields, are two large power stations of Cottam and West Burton. High Marnham is now closed. South of Nottingham, again near the Trent, is the Ratcliffe-on-Soar Power Station and near Newark there are plans for a gas-turbine power station at Staythorpe, next to the Trent, on the site of the former Staythorpe A & B coal-fired power stations. There are two current coal mines at Thoresby between Edwinstowe and Ollerton, and Welbeck at Meden Vale near Market Warsop. The county has comprehensive secondary education with 47 state secondary schools and 7 independent schools, including Worksop College, and the City of Nottingham LEA has 18 state schools and 6 independent schools, not including sixth form colleges. Nottinghamshire contains the ancestral home of the poet Lord Byron, Newstead Abbey, which he sold in 1818. It is now owned by Nottingham City Council and open to the public. The author D. H. Lawrence was from Eastwood in Nottinghamshire. The North of the County is also noteworthy because of its connections with the Pilgrim Fathers. William Brewster, for example, came from the village of Scrooby and was influenced by Richard Clyfton who preached at Babworth church. Nottinghamshire County Cricket Club is a first class cricket club who play at Trent Bridge in West Bridgford. They won the County Championship in 2005. Nottingham Forest is a League One football club and Notts County and Mansfield Town are in League Two. Other notable teams are Nottingham Rugby Football club and Nottingham Panthers Ice Hockey Club. 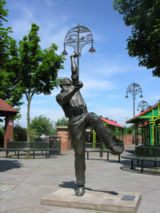 National and County cricket player Harold Larwood. The traditional county town, and the largest settlement in the historic and ceremonial county boundaries, is Nottingham. The City is now administratively independent, but suburbs including Arnold, Carlton, West Bridgford, Beeston and Stapleford are still within the administrative county and West Bridgford is now home of the county council. There are several market towns in the county. Newark-on-Trent is a bridging point of the Fosse Way and River Trent, but is actually an Anglo-Saxon market town with a now ruined Castle. Mansfield sits on the site of a Roman settlement, but grew after the Norman Conquest. Worksop, in the north of the county, is also an Anglo-Saxon market town which grew rapidly in the industrial revolution with the arrival of canals and railways and the discovery of coal. Newark, Mansfield and Worksop have suffered from the decline of mining since the 1984-5 miners' strike. Other market towns include Arnold, Bingham, Hucknall, Kirkby-in-Ashfield, and Retford. The main railway in the county is the Midland Main Line which links London St Pancras Station to Sheffield via Nottingham. The Robin Hood Line between Nottingham and Worksop serves several villages in the county. The East Coast Main Line from London King's Cross to Doncaster, Leeds, York, Hull Newcastle-upon-Tyne and Scotland serves the eastern Nottinghamshire towns of Newark and Retford. The M1 motorway runs north-south through the county, connecting Nottingham to London, Leeds and many other towns and major roads. The A1 road follows for the most part the path of the Great North Road, although in places it diverges from the historic route where towns have been bypassed. Retford was by-passed in 1961 and Newark-on-Trent was by-passed in 1964, and the A1 now runs between Retford and Worksop past the village of Ranby. Many historic coaching inns can still be seen along the traditional route. The East Midlands Airport is just outside the county in Leicestershire, while the Robin Hood Airport lies within the historic boundaries of Nottinghamshire but is just inside South Yorkshire. These airports serve the county and several of its neighbours. Together the airports have services to most major European destinations, and the East Midlands Airport now also has services to North America and Caribbean countries. As well as local bus services throughout the county, Nottingham and its suburbs have a tram system, Nottingham Express Transit. The council house and a tram in Nottingham market square.